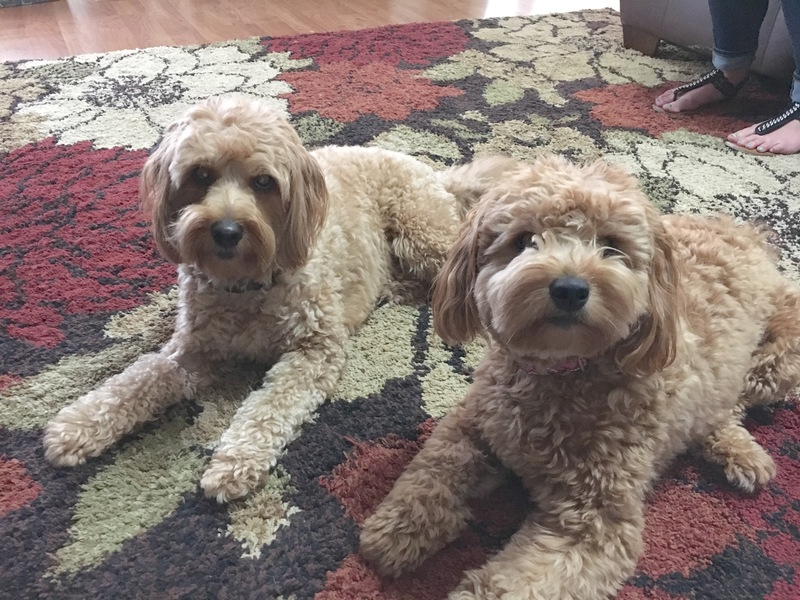 Penny is a two-year-old Mini Goldendoodle who was joined by ten-month-old puppy Berkley late last year. Their guardians set up a dog behavior training session with me to help Berkley who is starting to do some resource guarding. The dogs decided to take turns putting on a world class demonstration of jumping up on people as soon as the door opened. Later in the session I showed the guardians how to train the dogs to stay behind an invisible boundary several feet away from the door. By increasing the distance between the dogs and door, we can lower the intensity of their excitement and also demonstrate that the humans have the situation under control. When I sat down with the dog’s guardians, I gave them each a small bullystick. I did this to keep them occupied while I discussed the dog behavior problems they wanted to work on. It also gave me an opportunity to gauge the intensity of Berkley’s resource guarding. As we chatted about the situation, I would gently touch his back from time to time with my foot. Each time I did this he stopped chewing and froze until I stopped touching him. This indicated that its not an extreme case of Separation Anxiety as he didn’t growl. His back was to me but one of the guardians did report he curled his lips up when I made contact. Once Berkley was done with the bully stick I had given him, I pulled out a another one, popped myself down on the floor then had the guardian film me as I went over a dog behavior technique to stop resource guarding. Resource guarding is a serious issue and if you approach or otherwise push a dog who is guarding, they will absolutely react and there is a good chance they will bite you. Many people misinterpret this as a sign of aggression. But a dog behaviorist will tell you that while the reaction is an aggressive act, the behavior itself is not typically identified as aggression as once the object is not around, the dog stops acting in a guarding way. Resource guarding is not an indicator of an untrained, mean or disobedient dog. By feeding Berkley by hand while touching, then petting him, his guardians should be able to get him to feel comfortable with their presence while he eats. It will take a few weeks, but by doing so consistently at his pace, he will get better with food. Once the guardians are ready to go back to feeding from a bowl, I recommended they get a different bowl to help distance Berkley from the guarding food memory engrams. As I mentioned in the above video, the key to rehabilitating a dog with a resource guarding problem is crafting a situation where they no longer think you are going to take their item. In fact, the approach helps the dog see it as the new person is improving the dog’s situation. By the end of the session, the dogs were respecting the new rules we just introduced, were sitting to ask their humans for attention and looking to them for guidance. We wrapped up the session by filming Penny and Berkley’s Roadmap to Success. You can watch it by clicking the video icon below.